Pew: Religious Intolerance Is On The Rise Worldwide : The Two-Way For the first time since 2007, the United States saw a rise in government restrictions on religion. 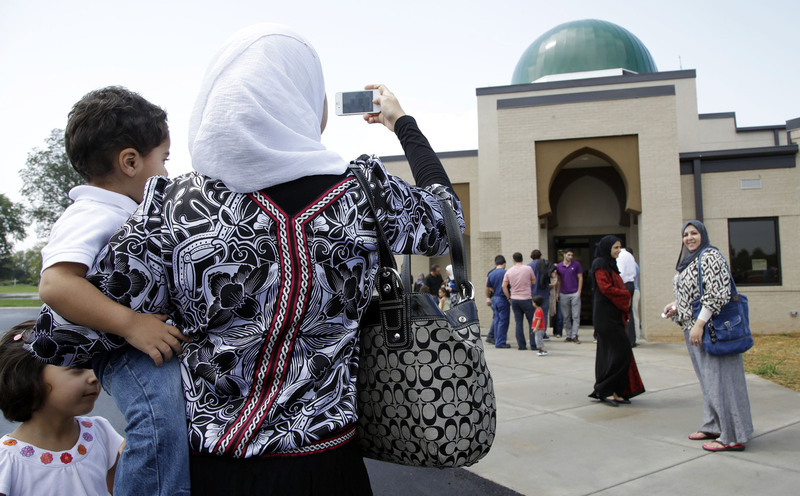 A woman takes a picture of the Islamic Center of Murfreesboro after midday prayers in August in Murfreesboro, Tenn. Opponents of the mosque waged a two-year court battle trying to keep it from opening. Religious intolerance is on the rise worldwide, according to a new study from Pew's Forum on Religion and Public Life. The study finds that during the past year three-quarters of the world lived in countries with "high government restrictions on religion or high social hostilities involving religion." That's five percent higher than a year earlier. Perhaps the biggest jump, Pew reports, is the rise in countries the forum considers to put high or very high restrictions on religion. That number jumped from 31 percent in 2009 to to 37 percent in 2010. One thing that is important to note is that this rise in intolerance holds true even if you rule out the recent unrest in the Middle East and North Africa. But it's also important to note that restrictions rose not only in those countries, but also in countries like Switzerland and United States. "In the year ending in mid-2010, there was an increase in the number of incidents in the U.S. at the state and local level in which members of some religious groups faced restrictions on their ability to practice their faith. This included incidents in which individuals were prevented from wearing certain religious attire or symbols, including beards, in some judicial settings or in prisons, penitentiaries or other correctional facilities. Some religious groups in the U.S. also faced difficulties in obtaining zoning permits to build or expand houses of worship, religious schools or other religious institutions. The U.S. also experienced an increase in social hostilities involving religion during this same period. A key factor behind the increase was a spike in religion-related terrorist attacks in the U.S. The increase also reflects a rise in the number of reported religion-related workplace discrimination complaints." The report mentions the incidents we're familiar with, including the attempt to stop the building of the Murfreesboro, Tenn. mosque. But it also said that for the first time, this report included allegations that "some level of government in the U.S. had imposed limits on conversion." They cite a case in which an inmate was denied the right to change his religious affiliation to Muslim. "The inmate complained that he could not participate in Ramadan observances without an official change to his religious designation in the New York Department of Correctional Services' records," Pew reports. Pew has posted its whole report on its website. The U.S.-specific sidebar is here. One way to quickly digest the big picture is with the interactive we've embedded below. Note how many countries were in the low-end of both government and social restrictions in 2007 and how those bubbles moved farther up and farther to the right in 2010.